Variable speed drive ATV212 - 0.75kW - 1hp - 240V - 3ph - wo EMC - IP21. EMC filter: Without EMC filter. 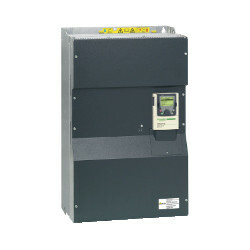 Variable speed drive ATV212 - 0.75kW - 1hp - 480V - 3ph - EMC - IP21. EMC filter: Class C2 EMC filter integrated. Variable speed drive ATV212 - 11kW - 15hp - 240V - 3ph -wo EMC - IP21. EMC filter: Without EMC filter. Variable speed drive ATV212 - 11kW - 15hp - 480V - 3ph - EMC - IP21. EMC filter: Class C2 EMC filter integrated. Variable speed drive ATV212 - 15kW - 20hp - 240V - 3 ph - wo EMC - IP21. EMC filter: Without EMC filter. Variable speed drive ATV212 - 15kW - 20hp - 480V - 3ph - EMC - IP21. EMC filter: Class C2 EMC filter integrated. Variable speed drive ATV212 - 18.5kW - 25hp - 240V - 3 ph - wo EMC - IP21. EMC filter: Without EMC filter. Variable speed drive ATV212 - 18.5kW - 25hp - 480V - 3ph - EMC - IP21. EMC filter: Class C2 EMC filter integrated. Variable speed drive ATV212 - 22kW - 30hp - 240V - 3ph - wo EMC - IP21. EMC filter: Without EMC filter. Variable speed drive ATV212 - 22kW - 30hp - 480V - 3ph - EMC - IP21. EMC filter: Class C2 EMC filter integrated.